4WD tasks too much for four-cyl? Commuters with only occasional need for more traction will be fine with front-wheel drive; but for the trailblazers, the Trailhawk is the way to go. Although the styling might have some disconnects -- from the past, and within itself -- the 2015 Jeep Cherokee delivers all the Jeep essentials, with impressive features and safety. The 2015 Jeep Cherokee has big shoes to fill. The original Jeep Cherokee that launched in 1986 set the bar for sport-utility vehicles that could be used as family transport, and it inspired a host of competitors, including the wildly successful, '90s-era Ford Explorer. 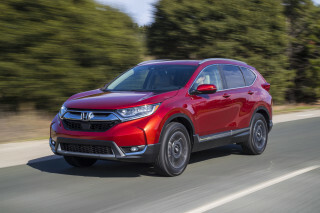 But times have changed over three decades, and what used to be truck-based SUVs are now "crossover utility vehicles" built on car underpinnings. They're more comfortable, more fuel-efficient, and much closer in spirit to passenger cars--but taller and with all-wheel drive as a required option. They're also nowhere near as simple and straightforward as the original Cherokee of yore. Today, the Jeep Cherokee is meant to be a mainstream choice for family duty—and a direct competitor to established crossovers that include the Ford Escape, Honda CR-V, Subaru Forester, and Toyota RAV4. It's a clean break from the Jeep Liberty it replaced, and the changes go far beyond the model name. It's no longer based on truck-like rear-wheel-drive mechanicals, and its styling is less blunt and bluff than the squared-off Liberty. But not everyone is going to be a fan of the exterior. One approach would have been to find a middle ground among Jeep's heritage, contemporary crossovers, and an edgy new direction. But the actual Cherokee leads off with a startling variation on the Jeep face, and then gives up by the time it gets to the windshield. In other words, its roles as a Liberty replacement, Dart derivative, and Compass mea culpa still aren't totally reconciled in the design. The front end splits its headlamps and underplays the grille—the one design detail that connotes Jeep no matter where it's seen, around the world. Those are unforgivable but reworkable flaws—and frankly, quirks that some will like. The rest of the body impresses as warmed-over leftovers, with a heavy reliance on crossover fallbacks in glass area and fender sculpting—rehashed Hyundai, inherited Grand Cherokee. The cabin does paramedic duty here, healing up all that poorly thought-out stretching with some palliative shapes and some truly nice finishes and Easter-egg touches (consider it a challenge to find all the hidden Jeeps inside). The Cherokee really sizes right in with models that would be called compacts in the U.S., like the CR-V, Forester, and Escape. Jeep might call it a mid-sizer, but it's right in with those models. There’s no third-row seat, but it's a relatively roomy five-seater, with a back seat that’s suitable for adults—or even asking three to sit across for shorter distances--but the jutting front headrests might enforce a slouching position that robs some of that rear-seat space. The second row slides fore and aft to choose between legroom and cargo space, and there’s a handy organizer for the more retentive fans. You have a choice between a four-cylinder engine and a V-6—which helps it stand out in a class that includes several models that have gone all-four-cylinder. The standard 184-horsepower, 2.4-liter in-line four is plenty strong for quick acceleration (as well as smooth and quiet for this class), provided there isn't too much weight aboard. The other new 3.2-liter V-6 makes 271 hp and 239 lb-ft of torque; it's torquey and generally happy with whatever work you throw its way. With the V-6 and a Trailer Tow Package, the Cherokee can pull 4,500 pounds. No matter which version, the Cherokee has fairly numb but accurate steering, with a well-tuned and well-damped ride. The Cherokee also sports a new ZF nine-speed automatic, with a lower first gear for quick takeoffs, plus some tall upper gears for good mileage on the highway. The top figure of 31 mpg highway isn't class-leading, but we've seen close to it in real-world conditions; 4WD models post a few mpg lower. One thing that should help improve the mileage of V-6 models -- in real-world stop-and-go driving, if not in official EPA ratings -- is the introduction of engine stop-start (ESS) in all 2015 Cherokee V-6s. Sport, Latitude, Limited, and Trailhawk editions are offered, with each model serving a different kind of buyer. Sport and Latitude models appeal to cost- and value-conscious families, while Limited models are the luxurious flagships of the lineup and Trailhawk models are ready for the trail. Jeep's Trail-Rated badge applies to the Trailhawk, and it gets a one-inch lift, unique front and rear fascias, an Active Drive Lock and locking rear differential, added skid plates, and red tow hooks. There are several different four-wheel drive systems, including Active Drive I, and Active Drive II (adding a dual-range transfer case). All models with 4WD have the Selec-Terrain system, with separate ’smart’ modes for Snow, Sport, Sand/Mud, and Rock, and in low-range models with four-cylinder engines, its crawl ratio is an astonishingly good 56:1. The National Highway Traffic Safety Administration (NHTSA) has rated the Cherokee at four stars overall, a score it earns in all but side-impact tests -- where it's given five stars. The Insurance Institute for Highway Safety (IIHS) gives it good scores on all tests, save for a small-overlap test not yet performed. The Cherokee offers a number of sophisticated active-safety and convenience features that are still relatively rare in this mainstream class -- including available adaptive cruise control that can bring it to a full stop if an impending collision is detected; optional lane-departure and forward-collision warning systems are also an option; and blind-spot monitors and parking sensors that can also trigger the vehicle to a full stop at low speeds, if obstacles are detected. For 2015 Jeep has already taken the Cherokee's safety kit and improved it in many respects. Latitude and Trailhawk models now include a ParkView backup camera plus automatic headlamps. And on Latitude, Limited, and Trailhawk models, there's a new package that combines Blind-spot Monitoring, Rear Cross-Path Detection, ParkSense rear park assist, and signal mirrors with courtesy lamps. About the only thing missing in the Cherokee's safety feature set is a clever surround-view camera system, which would be a boon for off-road use. The 2015 Cherokee also offers more options than you'll find in most other affordable crossovers -- if you're willing to spend extra, of course. Highlights include a CommandView panoramic sunroof and Sky Slider roof, memory heated/ventilated seats, and soft Nappa leather upholstery with ventilated front seats in the top Limited model. Infotainment systems include 8.4-inch Uconnect media center audio-streaming app connectivity (Pandora and Slacker, among others); and top models include a full-color reconfigurable LED instrument cluster. Quirky front-end styling mates oddly with an exterior that's otherwise unremarkable; yet a smartly penned interior balances it all out. The 2015 Jeep Cherokee can end up looking a lot more appealing if you get to know it first. That might sound like a backhanded compliment, but there's something true to it -- certainly in the way that Jeep fans will end up seeing the Cherokee. To be blunt, even a year in, the design still stands as a little unexpected and awe-inducing -- and not entirely in a good way. The sharp, futuristic (and arguably cluttered) front-end design is a direct challenge to square-jawed, Jeep tradition. But even if you can't quite reconcile with the front-end appearance, there's plenty else aesthetically appealing in the Cherokee to redeem it. On one side, the new front-end styling breaks out in a new direction, in a class that's starved for a new look. But in our eyes, the controversial look feels incomplete; in some ways it feels like a redux of the Compass, a model that blurred design lines and styling consistency in ways that were a little uncouth, a little unconvincing. The Cherokee's wan, thin nose is the first problem. Breaking up its LED running-light eyebrows from the headlamps sounds like a clever idea for cool looks after the sun sets, but in daylight it delivers an Aztek-like effect--a tiered face that looks like it's always being woken up too early. A Jeep should look wide and awake, like it's up before reveille. The essential seven-bar grille looks thinly drawn here; what was once a point of pride for Jeep is now an effete afterthought. Behind all that the front end promises, the Cherokee just can't seem to match its own conviction from the front fenders back. 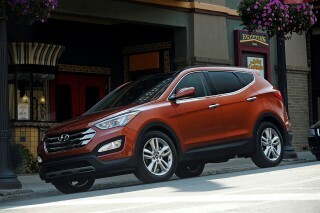 Why does it so strongly resemble a Hyundai Santa Fe from the side, or a Kia Sorento from the rear? It's washed clean of all the rectangles, but doesn't have anything new to show in those softened contours. Walk around the Cherokee a few times, and you get a sneaking suspicion that grander ideas for the rear styling were dashed in favor of focus groups or wind tunnels. While the exterior of the Cherokee polarizes, the interior peacefully unifies. It's sporty, not at all trucklike, and finished in smooth, fine fashion. The SUV theming is far from humorless, thank goodness. Jeep designers have penned in some great Easter eggs, like the 1941 Jeep Willys you'll find when letting the Cherokee park itself, or like the small but perfectly formed Jeep that rests at the base of the windshield, climbing over a sensor like it's a Moab boulder. You'll be happier inside looking out, than most Jeep traditionalists will be, outside, looking in. You get a tall, economical hatchback in front-drive four-cylinder Cherokee models; but V-6 Trailhawks have real off-road chops. The 2015 Jeep Cherokee is a crossover in the truest sense. It drives with even-handed aplomb and carlike poise, stuffed, in some of its presentations, with Trail Rated off-road abilities. Of the wide-ranging Cherokee lineup, we admire how much you can affect performance in this model simply by ticking the right option boxes. Get the four-cylinder engine and front-wheel drive and it's a tall, economical hatchback; or in with the six-cylinder and Active Lock off-road system, it's a nimble rock-scrambler. Most of the crossovers in the compact class have gone four-cylinder-only, but the Cherokee still offers a V-6. With a very strong 271 hp and 239 lb-ft, the 3.2-liter here is a downsized version of Pentastar V-6 also in the Grand Cherokee. In V-6 form, it feels somewhat heavier, though -- it tops 4,000 pounds in some guises -- but it manages to always feel quick, confident, and refined. 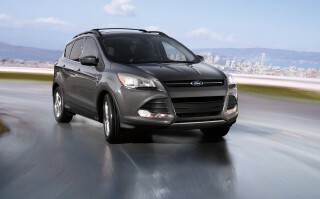 The standard engine is a 2.4-liter in-line four rated at 184 horsepower and 171 pound-feet of torque. It's by far the most refined, best-sounding Chrysler four-cylinder in a long time (and of course the more fuel-efficient); and provided you won't be loading up the Cherokee most of the time it feels reasonably powerful, with a 0-60 mph time of about eight seconds in base trim. 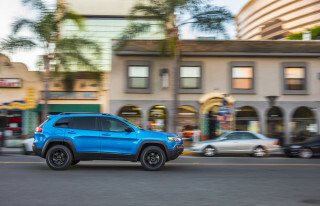 Regardless of which engine you get, the Cherokee sports a ZF nine-speed automatic, with a lower first gear for quick takeoffs, a handful of mid-range gears, and a trio of tall overdrive upper gears for good highway mpg. It's a gearbox that really wants paddle actuation, though we'd settle simply for more direct control over some shifts. Ride and handling are pleasant surprises in the Cherokee. Its steering has dual-pinion rack that delivers no feedback and somewhat heavy weighting, but there's good accuracy despite its off-road intentions and all-season tires. The Cherokee rides very well in most versions, with smooth damping over most urban streets and even into some unpaved ruts where it could rightfully balk. The Trailhawk deflects less road rash, thanks to off-road tires and an inch higher ride height. Jeep's Trail-Rated badge applies to the Trailhawk, which gets a one-inch suspension lift, slimmer front and rear fascias, a locking rear differential, skid plates, and red tow hooks. It also gets Selec-Speed control, which lets Cherokee climb hills with the same tenacity as it lowers itself with hill-descent control, creeping up from 1 mph to 5 mph in increments selected with the shift lever. Approach and departure angles are good for off-road work, at 30 and 32 degrees--and with ground clearance of 8.7 inches, the Cherokee really has very few rivals in its highly developed off-road niche. 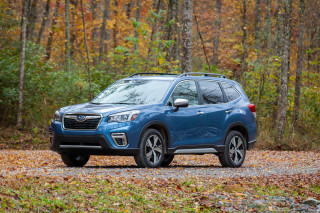 We're not even sure we'd want to take a high-riding Subaru Forester down some of the trails we dusted in the Cherokee, or if we'd want to pull as much as the 4,500 pounds the Cherokee is rated to tow. It may be the only Swiss Army knife in the crossover-SUV drawer. Active Drive II is a step up in ruggedness and off-road ability, as it gets a low range with a very low crawl ratio of 56:1 with the four-cylinder. All Cherokees with four-wheel drive have Selec-Terrain, which lets drivers choose the best mode from Sport, Snow, Sand/Mud, and Rock. Sport splits torque front-to-back at 40:60 ratio; Snow reverses that ratio and starts the Cherokee in second gear for less slip; the sand and rock modes allow a rear split of up to 100 percent, and are combined with off-road braking modes. Here, the Cherokee's rear axle will declutch when not in use, which helps improve mileage, on the highway especially. Not all Cherokee models are off-road-worthy -- or even have all-wheel drive. Active Drive I is set up for getting through snowy driveways, and has a wet-clutch design and variable torque distribution between the front and rear wheels. It's handled automatically by the sensors that also govern the Cherokee's throttle and transmission and stability control, and there's no low range. 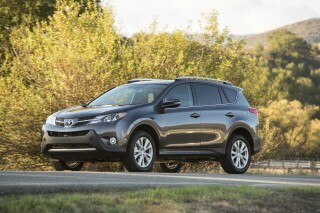 It's offered on the four-cylinder, and it could add to cornering responsiveness. The driving position in the 2015 Cherokee is slightly off, but that doesn't hamstring its spacious cabin. The 2015 Jeep Cherokee isn't all that much roomier inside than other crossovers at the spacious end of compact -- like the Subaru Forester, Hyundai Santa Fe Sport, and Honda CR-V. And you won't find a small third-row seat option as in the new Nissan Rogue. 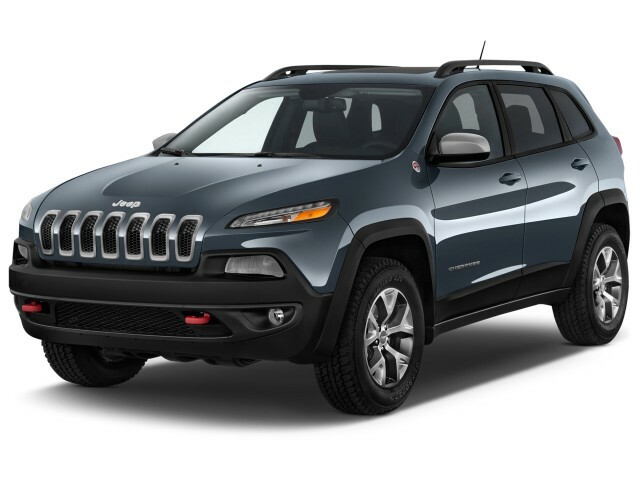 But there's more comfort and refinement in the 2015 Cherokee than you might expect -- especially considering the potential for rugged off-road ability. The Cherokee sits about 182 inches long, with a wheelbase of about 106 inches. It has 41.1 inches of front-seat leg room, about 38 inches of head room front and back, and 40.3 inches of rear-seat leg room. There are several versions of front seats offered in the Cherokee, and we like most of them. The seats are supportive enough in their Latitude trim, nicer with Nappa leather in Limited trim. All of the different seats have headrests that sit forward too much, though, which forces some drivers into a more laid-back driving position. Bigger drivers will be making contact with the center console and the door panels, but not objectionably so. It can be tough for taller drivers to find an ideal driving position, as the Cherokee's steering wheel tilts up a bit from its bottom, in what we'd call classic Fiat style, and the windshield doesn't rise very high. Officially, by the specs, the Cherokee has about the same rear-seat room as the Grand Cherokee, but subjectively, they're worlds apart. In the smaller ute, tall drivers leaning back puts the front seatback into the knees of tall rear-seat passengers, an automotive domino effect that can be mitigated by sliding the second-row seat back on its track a few inches. 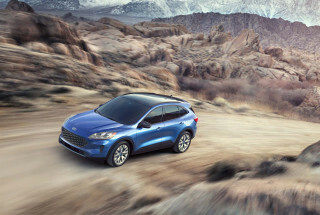 Throughout the interior, small-item storage is good, with lots of soft-touch surfaces, plenty of storage spaces for small items, and impressive Uconnect infotainment systems. There's a bin atop the center stack for a handful or two of stuff, and a glove box that can hold an iPad. And the center console has a groove that props up smartphones. In terms of materials and quality, there's a lot to like here. With high-quality, low-gloss, soft-touch surfaces and smooth-acting buttons and switchgear, the Cherokee's 'touch points' are those of a more expensive vehicle. Interior noise levels are filtered out very well, too; it's the first Chrysler four-cylinder in a long time that didn't draw our groans for its groaning. You'll find more active-safety features in the 2015 Jeep Cherokee than in most other mainstream crossovers in this price range. With more active-safety features than most models in this affordable class of crossovers, and pretty good crash-test results so far, the 2015 Jeep Cherokee is a good safe bet for families. The National Highway Traffic Safety Administration (NHTSA) has rated the Cherokee at four stars overall, a score it earns in all but side-impact tests -- where it's given five stars. The Insurance Institute for Highway Safety (IIHS) gives it good scores on most tests, but it earns an embarrassing 'marginal' rating in the small overlap category, simulating a frontal collision with a tree or utility pole. The Cherokee offers a number of sophisticated active-safety and convenience features that are still relatively rare in this mainstream class -- including available adaptive cruise control that can bring it to a full stop if an impending collision is detected; optional lane-departure and forward-collision warning systems are also an option; and blind-spot monitors and parking sensors that can also trigger the vehicle to a full stop at low speeds, if obstacles are detected. For 2015 Jeep has already taken the Cherokee's safety kit and improved it in many respects. All Cherokees come with ten airbags, including rear-seat side airbags and driver and front passenger knee airbags. But the available Forward Collision Warning Plus now includes low-speed crash-mitigation support, while the Latitude and Trailhawk models now include a ParkView backup camera plus automatic headlamps. And on Latitude, Limited, and Trailhawk models, there's a new package that combines Blind-spot Monitoring, Rear Cross-Path Detection, ParkSense rear park assist, and signal mirrors with courtesy lamps. The IIHS rated the 2014 Cherokee's forward crash prevention as 'Basic' when optioned with the Technology Group's Forward Collision Warning with Crash Mitigation; with the improved equipment for 2015 it's stepped that rating up to the top 'Superior' level. There's also the Cherokee's flavor of hands-free parking. Here the system can steer and nudge the car into a parallel or a conventional parking spot, with the driver serving as a final failsafe. It's the latest driving gadget that impresses most the first two or times you demonstrate it to friends. Bluetooth is standard on the Cherokee, and outward visibility is fairly good. That said, a rearview camera is standard only on the Limited model, although optional on the other trims. About the only thing missing in the Cherokee's safety feature set is a clever surround-view camera system, which would be a boon for off-road use. The 2015 Cherokee offers all the available off-road gear you might expect; and its Uconnect systems are a snap to use. Among its four trim levels -- Sport, Latitude, Limited, and Trailhawk -- the 2015 Jeep Cherokee appeals to a broad swath of crossover shoppers. 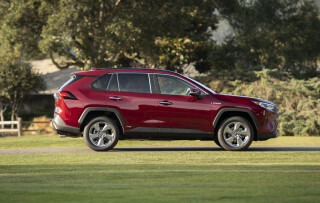 At its most affordable, the 2015 Cherokee Sport takes on some smaller, more basic hatchbacks and crossovers. It's a four-cylinder, front-wheel-drive model, with a simple Active Drive I all-wheel-drive system as an option. The audio and phone display is a 5.0-inch screen, with redundant information in a 3.5-inch screen located between the gauges. Meanwhile, standard equipment in the Cherokee's most affordable form includes LED running lights and rear taillamps; air conditioning; cruise control; power windows, locks, and mirrors; cloth seats; keyless entry; 17-inch wheels with all-season tires; an AM/FM radio; a USB port and an auxiliary jack; and Bluetooth with audio streaming. With the Latitude model, you add a fold-flat front passenger seat; LED ambient cabin lighting; a 115-volt power outlet; roof rails; and fog lights. You can opt for some of the desirable stuff, like the Active Drive II all-wheel drive; the V-6; a 506-watt Alpine audio system; a panoramic sunroof; cold-weather and towing packages; a convenience package with pushbutton start, satellite radio, tonneau cover, power driver seat, power tailgate, rearview camera, and remote start; and Uconnect with an 8.4-inch touchscreen and smartphone-app connectivity. We continue to be impressed with the Uconnect suite of connectivity services, as much for its easily absorbed graphics and functions as for its quick responses. And at the top of the lineup is the Jeep Cherokee Trailhawk takes Latitude standard equipment and couples it with a Trail Rated badge--which comes with the ability to cross California's Rubicon Trail, Jeep's gold standard for off-road capability. To do that, the Trailhawk gets a tougher suspension with more ground clearance; its own front and rear bumpers; red tow hooks; skid plates; transmission and oil coolers; the most advanced Active Drive system with a locking rear differential; Selec-Speed Control, which lets the Jeep climb up grades at a consistent speed; and 17-inch wheels and OWL all-terrain tires. Options include the V-6 engine; navigation; Alpine audio; the panoramic sunroof; an open-air sliding glass sunroof; and the cold-weather, technology, convenience, towing, and leather packages. 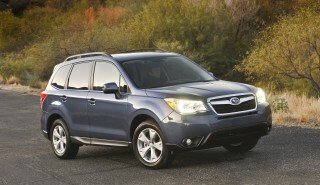 Those who want a luxurious, top-of-the-line model but without the off-road equipment will want Limited. It adds to the Latitude's feature list power front seats; leather upholstery; heated front seats; pushbutton start; 18-inch wheels and tires; a 7.0-inch reconfigurable information screen in the gauge cluster; the Uconnect touchscreen radio; satellite radio; a rearview camera; remote start; and dual-zone automatic climate control. Options include the V-6; Active Drive I or II; navigation (available after the original purchase as a dealer download); Alpine audio; the panoramic sunroof; a wireless charging pad; comfort and towing packages; a luxury package with Nappa leather, ventilated front seats, memory seating, and remote start; and a tech package with lane-departure and forward-collision warnings, adaptive cruise control, parking sensors, blind-spot monitors, and Park Assist. For 2015, all Cherokee models with the V-6 get engine stop-start (ESS) technology, which saves fuel by shutting the engine off when the vehicle is in gear but at a complete stop; when the driver lifts pressure off the brake pedal, the engine automatically restarts . Fuel efficiency is good for four-cylinder models of the Cherokee; and new engine stop-start should give V-6 models a boost. The Jeep Cherokee has a standard nine-speed automatic transmission, yet that doesn't mean its mileage tops other models in this class. Many rival models here—like the Hyundai Santa Fe Sport, Ford Escape, Honda CR-V, and Chevy Equinox—meet or beat the Cherokee's numbers. But on the other hand, new technology for 2015 help up the ante. The beefed-up body structure and heavier running gear its Trail Rating demands accounts for at least some of that mileage penalty.The base front-drive Cherokee has the best numbers, of course. It's rated at 22 miles per gallon city, 31 mpg highway, and 25 mpg combined. In most cases those numbers would push the Cherokee to our next-highest green score--but since we believe most versions will come with at least some form of all-wheel drive and/or the optional V-6, we're going by the bulk of its EPA-combined averages, all in the low-20s. Speaking of that V-6, it now includes engine stop-start (ESS) technology, which adds a higher-capacity starter, heavy-duty flywheel teeth, and a more robust starter solenoid—plus some smart controls—to automatically stop the engine when you're waiting at a traffic light or stop sign then restart the engine when you lift off. That doesn't affect the official EPA ratings for six-cylinder Cherokees, but it should make those models considerably better than last year's V-6s in low-speed stop-and-go driving. Fuel economy for the V-6 Cherokee starts at 19/28 mpg or 22 mpg combined for front-drive models; Active Drive I all-wheel drive lowers highway economy to 27 mpg; and Active Drive II drops it to 26 mpg highway. Adding the basic all-wheel-drive system to the four-cylinder Cherokee drops gas mileage to 21/28 mpg, or 24 mpg combined; going with the more advanced Active Drive II setup lowers highway mileage by one more mpg, to 27 mpg, and combined numbers to 23 mpg. the thing looks Pretty, but basically is a dodge dart on big tires. The Uconnect won't work properly with our phones (samsung s7's) fuel economy is worse then my 2000 F150 5.4l 4x4 averaging 15.3l per 100km... the thing looks Pretty, but basically is a dodge dart on big tires. The Uconnect won't work properly with our phones (samsung s7's) fuel economy is worse then my 2000 F150 5.4l 4x4 averaging 15.3l per 100km. Interior fit and finish is sloppy power window and door lock switches slide around in their locations, Stowage for a suv though it looks roomy is the same as the Hyudia Tiburon it replace. ESS helps with the fuel economy but takes some getting use to just waiting for it to leave me stranded on the side of the road. During the test drive my wife loved this vehicle, after owning it for just over a month it's not a keeper. Excellent SUV in size, comfort & economy. Great little SUV, just right for us. 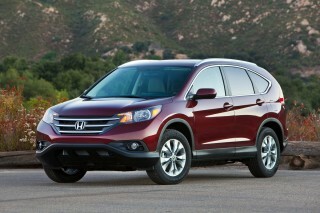 A terrific SUV but with some faulty electronics and poor fuel economy. I really like the Jeep a lot, there are many fine features including the fit & finish. its quite luxurious inside and very pleasing to the eye. However, I don't think it's quite ready fro prime time. Our 2015... I really like the Jeep a lot, there are many fine features including the fit & finish. its quite luxurious inside and very pleasing to the eye. However, I don't think it's quite ready fro prime time. Our 2015 model, ordered direct from the factory, came with multiple electronics issues - not the least of which was a very quirky rear sensor module that needed replacement within the first 4 months of ownership. It still has issues and we drive it now without some of the rear sensor array turned on.